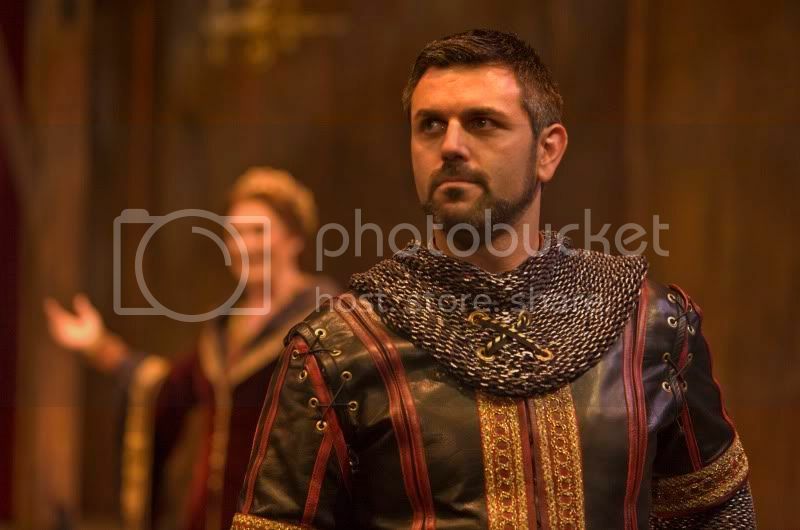 John Pasha as Richard “the Lionheart” in the Shakespeare Santa Cruz production of “The Lion In Winter”. As with "Love's Labor's Lost", I went into this play totally cold. There's a brief description of the plot on the page for the show (linked above), but it doesn't do the play justice. The best way of describing this show is part Tudors, part Twits, and a hint of the Prodigal son parable. Henry II is preparing for his succession, and like any good monarchs-in-training would, the three boys fight, plot, and do their utmost to secure their spot as the future King. Marco Barricelli conveys the conflict of deciding what is best for the empire he has built and reconciling that against how he feels about his sons. There are complex family dynamics at work in this play, mainly how the imprisoned wife and the scheming sons interact. Everyone is working toward their own end goals, politically aligning themselves for their best benefit, but looking over their shoulders the whole time. There is definitely some artistic license taken with the history, but it didn't ruin my enjoyment of the play. (For reference, I *love* The Tudors.) If you can't cope with anachronisms, perhaps you should skip this show, and for that matter, any historically-based costume drama. If not, this play is not to be missed. I highly recommend the movie with Katherine Hepburn, Peter O'Toole, and Anthony Hopkins. I spent most of it wondering how anyone has ever dared to put up the show again, given the caliber of acting on screen in front of me. That said, I'd love to see it live! And that man is definitely handsome. Mrowr.